Come experience the beauty and serenity of our botanical gardens! Enjoy the color and variety of species available as the seasons change. 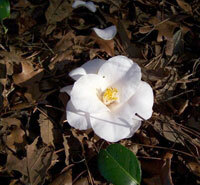 Discover the native, historic and exotic plants and flowers that grace the gardens and trails. Little firm evidence exists revealing the exact design of Louis LeConte's garden. Research indicates that "formal gardening" was popular among some southeastern coastal planters during the early 1800s. It is thought that English botanist, J.C. Loudon's writings, identifying the five classes of gardens, had an influence on Louis's choice of design style. In 1896, when Joseph LeConte made one final visit to Woodmanston he observed that the garden that was his "joy and delight in childhood" had fallen into a state of abandon and disrepair. By 1971 all that remained was a lone Camellia tree, a stand of old-fashioned crepe myrtles and two very old Sabal Palmettos that framed and marked the alignment of the front facade of the LeConte's plantation house. Fortunately, the story didn't end there. In the early 1970's Colonel Claude Black found traces of the old garden and an organization was quickly formed to preserve the site. Much can be said about the effort, planning and dedication of members of The Garden Club of Georgia, our site director and foundation members to preserve and restore the site over the years. The Garden Club became involved shortly after the gardens were rediscovered. Their efforts continue to this day. Read an article by the Garden Club of Georgia. Master gardeners, Garden Club members and county extension agents are using extensive research to restore and expand Louis's famous gardens. Check the "News" page for information concerning their progress or come and see it for yourself. For details go to the "Plan Your Visit" and "Contact Us" pages. 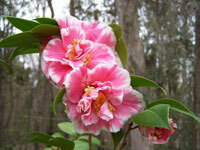 The American Camellia Society has made LeConte-Woodmanston a part of the National Camellia Trail. The Georgia Iris Society has generously offered to donate iris bulbs for our formal gardens and the Georgia and Florida Daffodil Societies will help us locate 36 varieties of bulbs that existed in Louis's historic garden.